The GTR1 ships with a a pouch and microphone clamp. 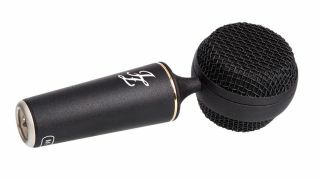 JZ Microphones has announced the GTR1, its first dynamic microphone to be designed specifically for use with guitar cabinets and combos. This offers an extended frequency range (50Hz - 18kHz) and is designed to suit all guitar sounds and genres. The neodymium magnet-equipped cardioid capsule is housed in a handcrafted all metal body, and a pouch and microphone clamp are included in the package. Find out more on the JZ Microphones website. The GTR1 will be shipping in March - pricing is still to be confirmed.